I like this piece because of the proportions and overall design. It’s also a good example of “what you usually read ain’t necessarily so”. It dates from before Ellis went to work for Stickley and it contains curved corbels on the panels that serve no purpose beyond looking cool. This link shows what the original looks like. As a furniture-maker, I’m not so picky about doing things exactly the way they were done way back when. I like to build reproductions, but my intent isn’t to fool anyone into thinking the things I built last year were made 100 years ago. Sometimes I use original materials and colors, but sometimes it’s fun to see what a piece looks like in different materials, or combinations of materials. I built my version of this chest for the November 2005 issue of Popular Woodworking magazine. I used jatoba for the frame and quilted maple veneer for the panels. I’ve seen several versions online made by people who read the magazine article 12 years ago. There was at least one reader who made a doll-house size version. 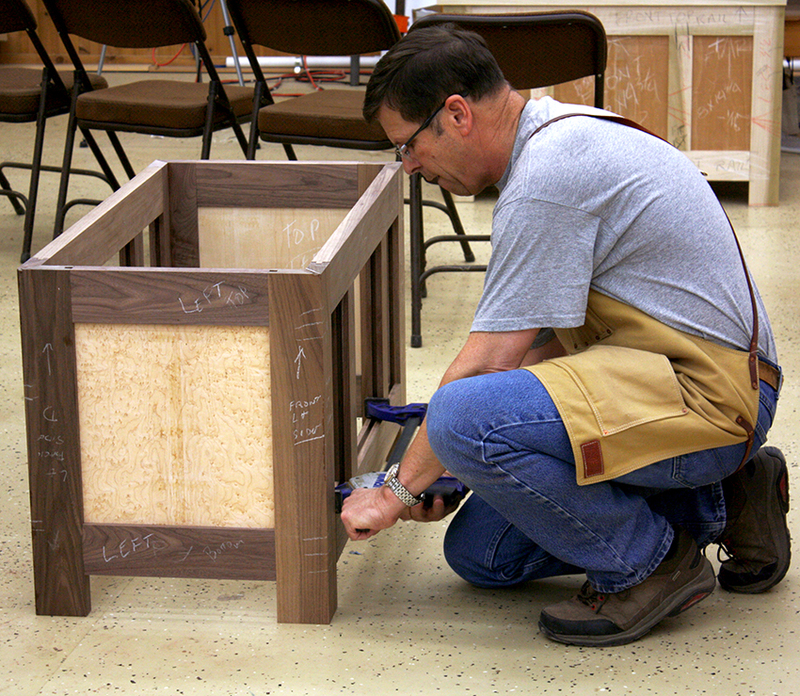 Last week I taught a class in building it at the Marc Adams School of Woodworking in Franklin, Indiana. I was curious as to what people would show up with, and we ended up with a variety of wood combinations. 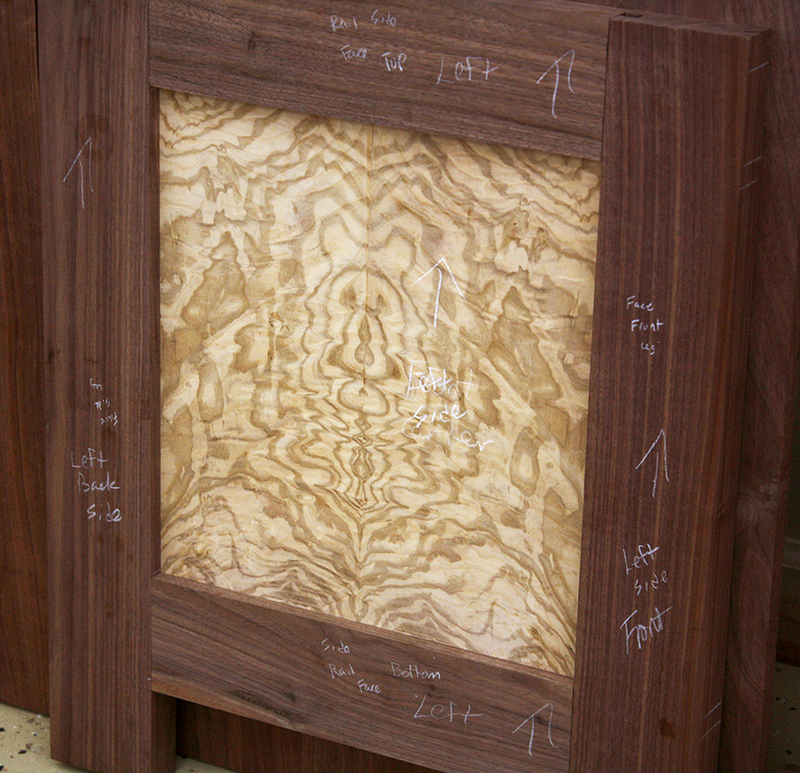 Walnut was the most popular frame material, due in part to the fact that we had a father and son participate. They had air-dried walnut from trees on the father’s property. They decided to go for slab tops instead of paneled tops to make use of wider pieces from their home-grown walnut stash. The chest in the foreground of the picture to the left has solid panels of quarter sawn sycamore, also from their own property. The son opted for veneered panels, using some wild olive ash burl veneer. The picture at right shows one of the end panels from that chest. I think if you look at it just right you can see an image of Yogi Bear. One note about the chests in these pictures. These are all dry fit, there isn’t any glue holding these together and the quality of the joinery holds the assembled cases together. There wasn’t any need to force the carcases together with tons of clamp pressure. Good, sound mortise and tenon joinery was one of the focal points of this class. As the week neared an end we began to think that if a tornado warning were to sound, the inside of our cases might be a good place for shelter. You also likely notice all the chalk marks on these chests. That was another important lesson. 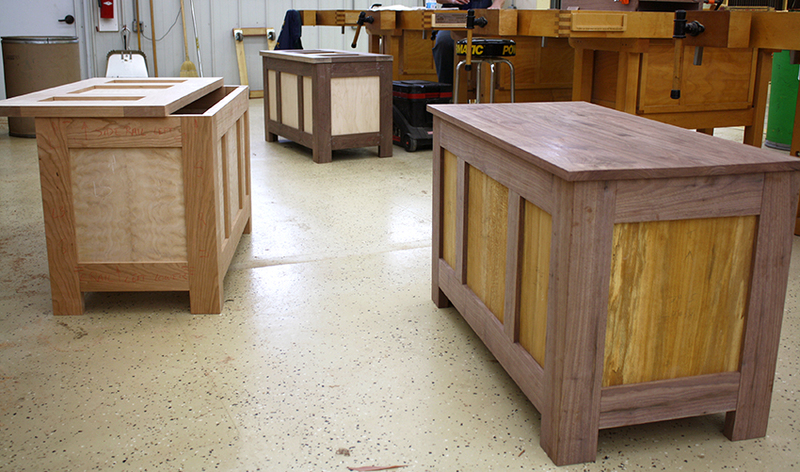 With a piece that showcases nice material it takes time on the front end to choose which piece of wood goes where. You need a system to keep track of that as you go from a stack of lumber, to parts in various stages of production, to assembled panels to arrive at a nice piece of furniture. One of the fortunate things about the material on hand was that we had rough boards wide enough to get two adjacent legs from the same board. 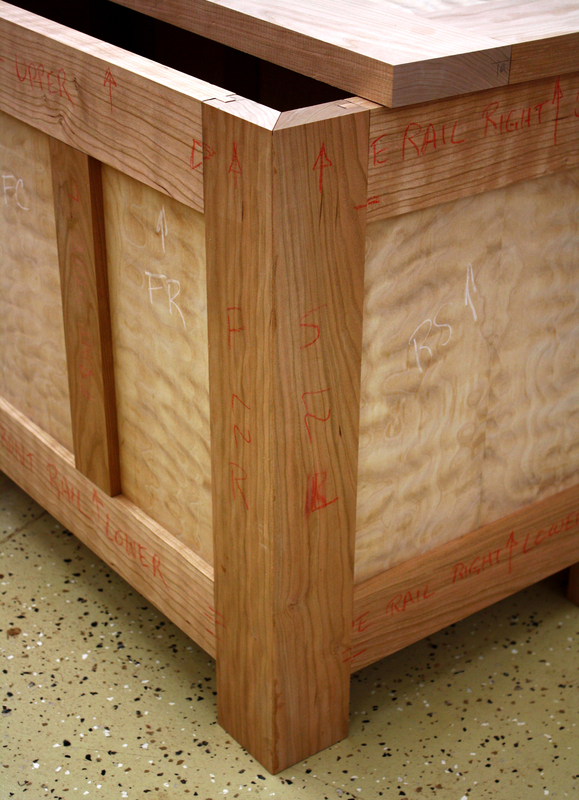 When the case is finished, the legs appear to be massive posts. In reality the legs are two pieces connected with a miter joint on one of the long edges. If you do it right you can make the grain fold around the corner as you see in the photo at left. It’s a nice touch, but it means one more detail to keep track of as the work progresses. As always, my week at Marc Adams was a mix of hard work in good company. We were blessed with a great group of students, good weather and a wonderful facility with a helpful staff. I’m going back for two weekend classes in July and August. Click the titles above for more information about these classes and register at the MASW website. Click Here to visit the Marc Adams School of Woodworking website for information about the school and other available classes. Coming soon on this site, I’ll be detailing how to make those long miter joints manageable. I don’t teach very often and you won’t find me teaching the same class over and over again. If you’re interested in having me present a class or a demo for your group, click my signature above to get in touch by e-mail.